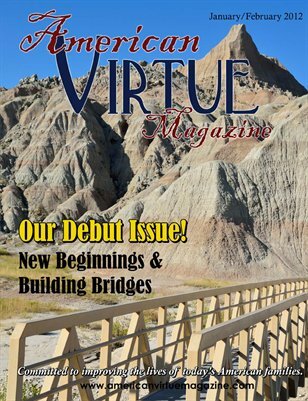 American Virtue Magazine is committed to improving the lives of today's American families. We believe that by focusing on similarities and common concerns, all Americans can find a voice and a renewed sense of hope. In this issue: Taking the Hill: Erica Strauss on unity & food security; American Dreams: Harriette Jacobs & Melonie Kennedy discuss the culmination of dreams; American Entrepreneurs: an interview with Annette Reeder, Biblical Nutrition Consultant; Visions of America: photographic essay by Erin Skye; Raising Patriots: Serving special needs families in your community, with Jenny Herman; Yellow Ribbon: Jami & David Williamson explain how their marriage survives the military; Hearth & Home: Peggy Witter refurbishes a beloved desk & Marie Duval’s community reclaims the land for a family’s new home; Exploring America: Tour the great state of Alaska with Kristi Duckett; Resources & Reviews: Books on astronomy, healthy living, and urban homesteading.